Rice University scientists are counting on films of carbon nanotubes to make high-powered, fast-charging lithium metal batteries a logical replacement for common lithium-ion batteries. The Rice lab of chemist James Tour showed thin nanotube films effectively stop dendrites that grow naturally from unprotected lithium metal anodes in batteries. Over time, these tentacle-like dendrites can pierce the battery's electrolyte core and reach the cathode, causing the battery to fail. That problem has both dampened the use of lithium metal in commercial applications and encouraged researchers worldwide to solve it. Lithium metal charges much faster and holds about 10 times more energy by volume than the lithium-ion electrodes found in just about every electronic device, including cellphones and electric cars. "One of the ways to slow dendrites in lithium-ion batteries is to limit how fast they charge," Tour said. "People don't like that. They want to be able to charge their batteries quickly." The Rice team's answer, detailed in Advanced Materials, is simple, inexpensive and highly effective at stopping dendrite growth, Tour said. "What we've done turns out to be really easy," he said. "You just coat a lithium metal foil with a multiwalled carbon nanotube film. The lithium dopes the nanotube film, which turns from black to red, and the film in turn diffuses the lithium ions." 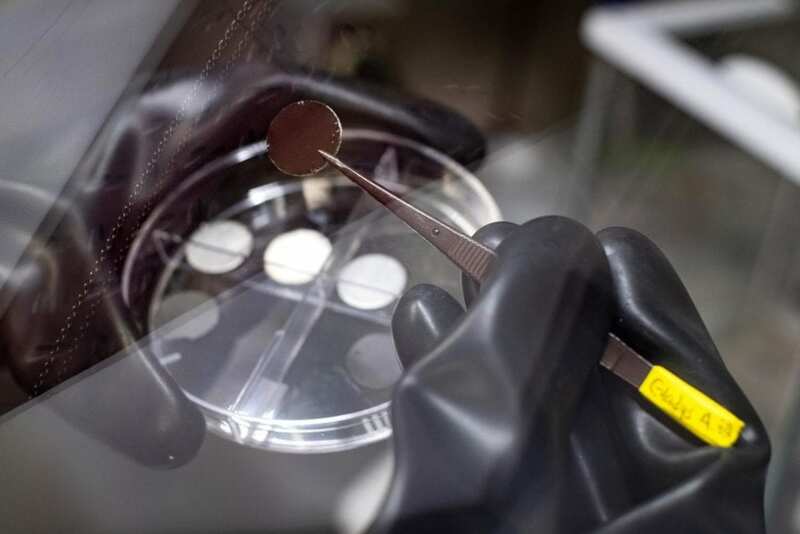 "Physical contact with lithium metal reduces the nanotube film, but balances it by adding lithium ions," said Rice postdoctoral researcher Rodrigo Salvatierra, co-lead author of the paper with graduate student Gladys López-Silva. "The ions distribute themselves throughout the nanotube film." When the battery is in use, the film discharges stored ions and the underlying lithium anode refills it, maintaining the film's ability to stop dendrite growth. The tangled-nanotube film effectively quenched dendrites over 580 charge/discharge cycles of a test battery with a sulfurized-carbon cathode the lab developed in previous experiments. The researchers reported the full lithium metal cells retained 99.8 percent of their coulombic efficiency, the measure of how well electrons move within an electrochemical system. Co-authors of the paper are Rice alumni Almaz Jalilov of the King Fahd University of Petroleum and Minerals, Saudi Arabia; Jongwon Yoon, a senior researcher at the Korea Basic Science Institute; and Gang Wu, an instructor, and Ah-Lim Tsai, a professor of hematology, both at the McGovern Medical School at the University of Texas Health Science Center at Houston. Tour is the T.T. and W.F. Chao Chair in Chemistry as well as a professor of computer science and of materials science and nanoengineering at Rice. The research was supported by the Air Force Office of Scientific Research, the National Institutes of Health, the National Council of Science and Technology, Mexico; the National Council for Scientific and Technological Development, Ministry of Science, Technology and Innovation and Coordination for the Improvement of Higher Education Personnel, Brazil; and Celgard, LLC. Read the abstract at https://onlinelibrary.wiley.com/doi/10.1002/adma.201803869.